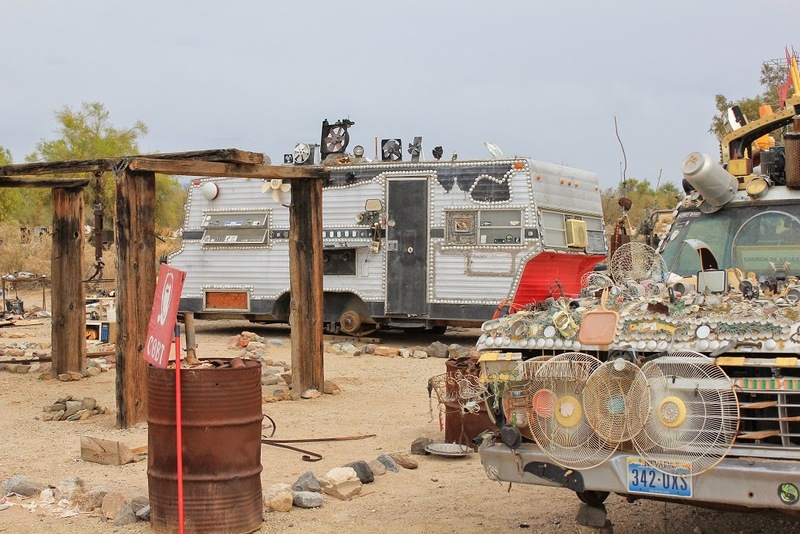 Slab City or The Slabs started off in 1942 as a Marine Corp base named Camp Dunlap, but was dismantled in 1956. 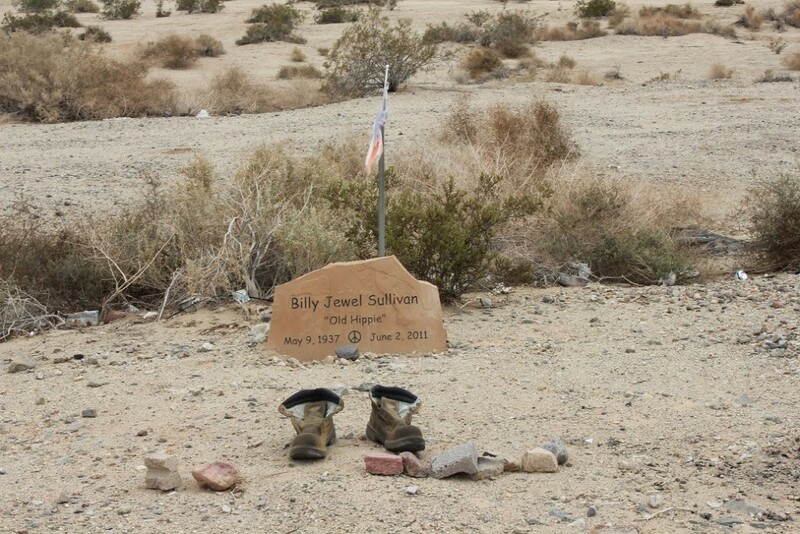 Some years later a chemical company in Oakland, California hired 20 men to harvest creosote leaves near Niland. 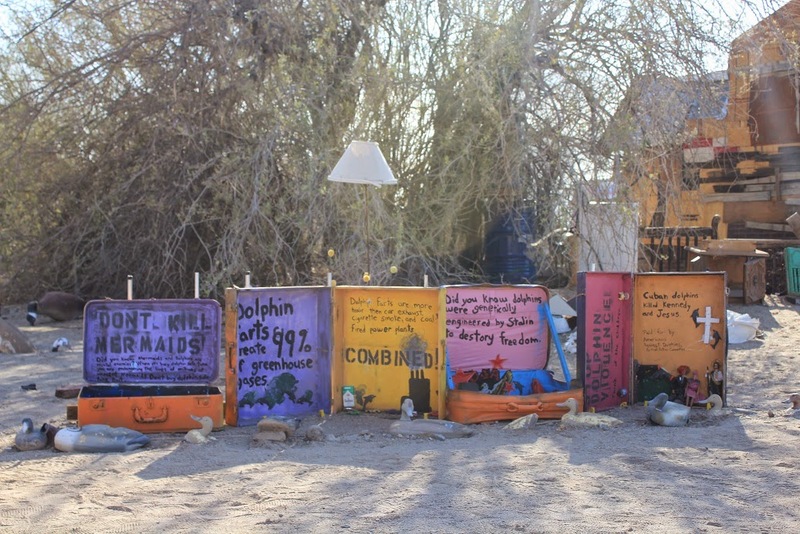 Some of the workers moved closer to their work by living in small trailers at the abandoned Camp Dunlap. 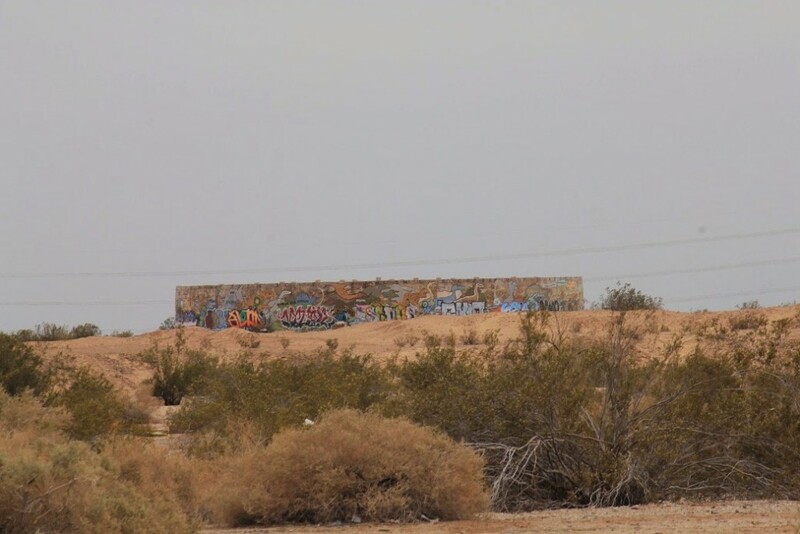 This was the start of what is now called Slab City. 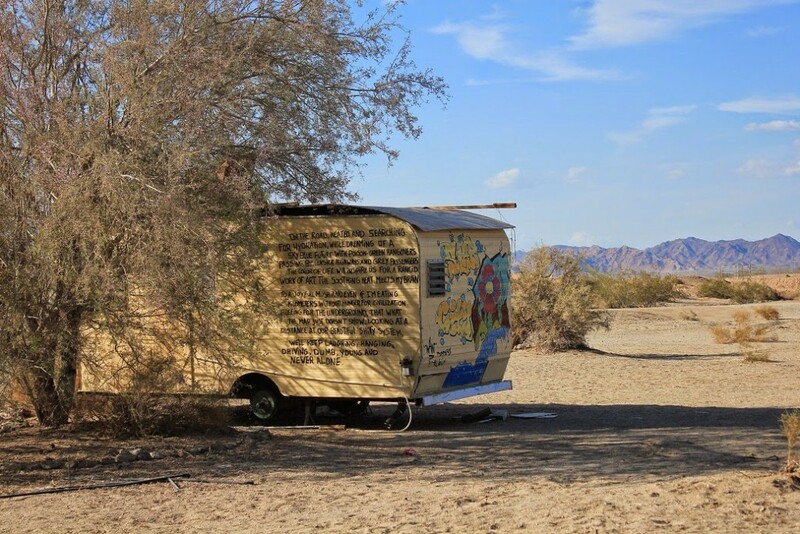 In 1965, the county ordered people to leave a camping area at Painted Canyon near Mecca, California. 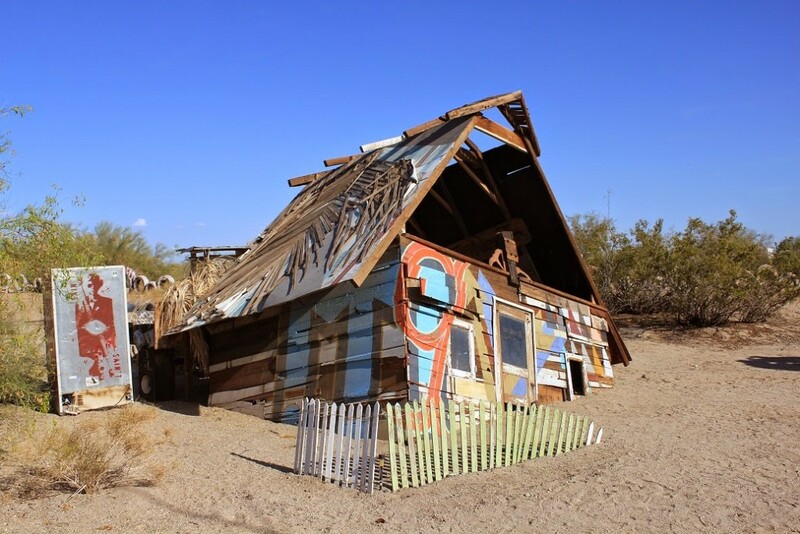 Some moved to Bombay Beach, and Georgetown while others moved to Slab City. In the winter, the Slabs population swells to several thousand, due to all the Snowbirds who travel south from colder locations. 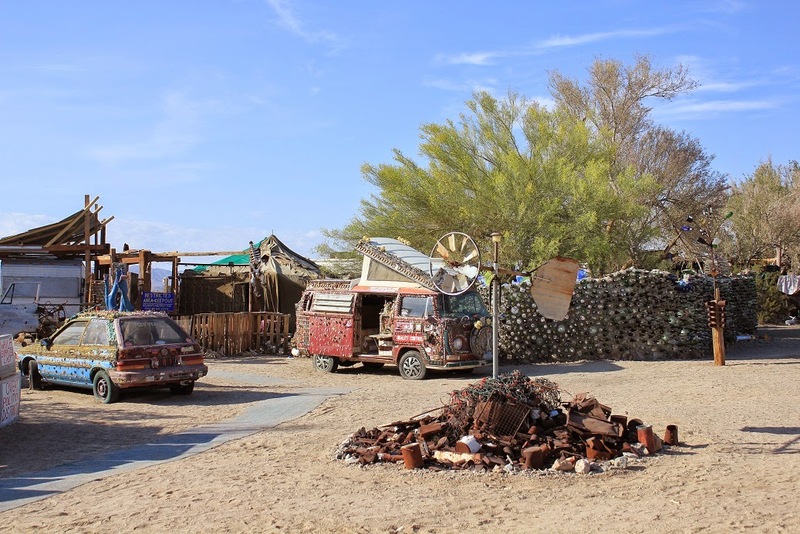 In the summer, the population dwindles down to about 150 permanent citizens. With the temperatures getting as high as 120F(48C) I can only imagine how tough the summer months must be for them. 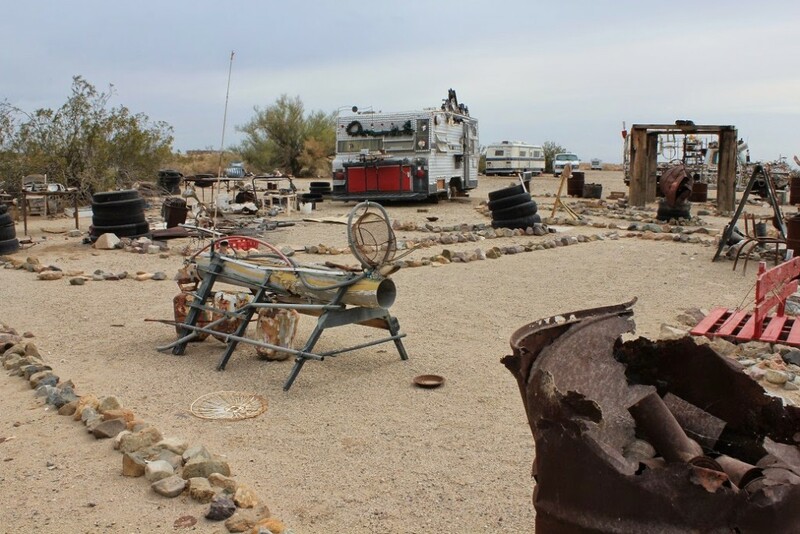 We stopped at Niland on the way in, to get some ice, and it’s a pretty rough looking town. The neighbourhoods are unkempt and poor. 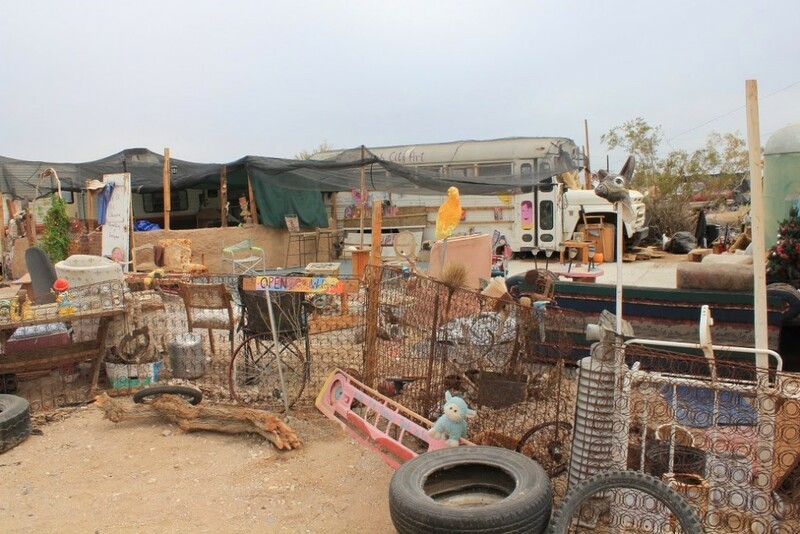 Some of the homes are well taken care of, while others are so overfilled with garbage it spills out the doors and everywhere into the yards. We drove past a messy trailer park and saw one of the trailers was flying a Nazi flag, while his neighbour flew a Rebel flag. As we drove down the street, we saw a woman walking down the middle of the road towards us. She was so underweight she looked like a walking skeleton, her hair was straggly and wild, eyes glassy and zombie like, her skin was tanned to a dark brown leather. Her mouth was pulled up into a grimace-like smile, her pink gums devoid of even one tooth. We slowed down and stopped, so we wouldn’t hit her, and she just floated past us, completely unaware we were even there. It seemed very obvious she was a meth addict. In the store, it was hard not to stare at the assortment of people. All seemed to be very down on their luck, a few were obvious drug addicts, looking much like the woman we’d seen walking in the road. I wondered what the Slabs held for us if this was what civilization looked like here. 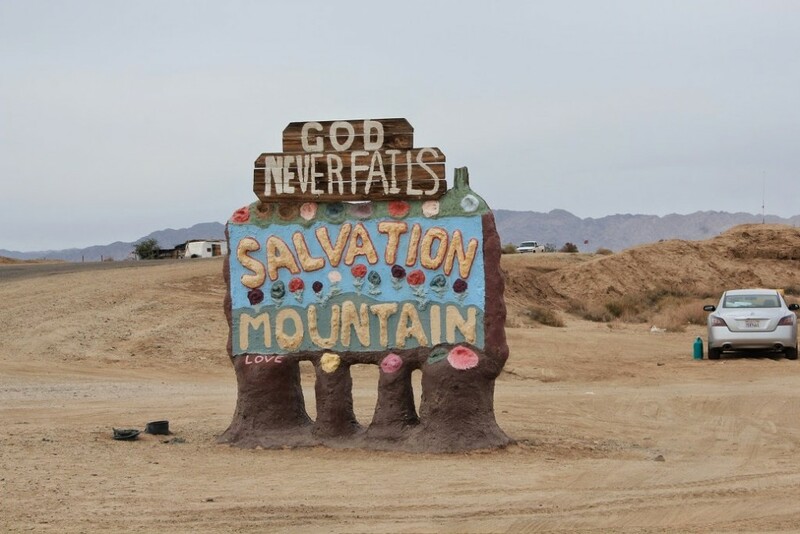 You see Salvation Mountain long before you reach it, it’s big cross and colourful decor popping out of the beige landcape ahead as a beacon to where you are headed. 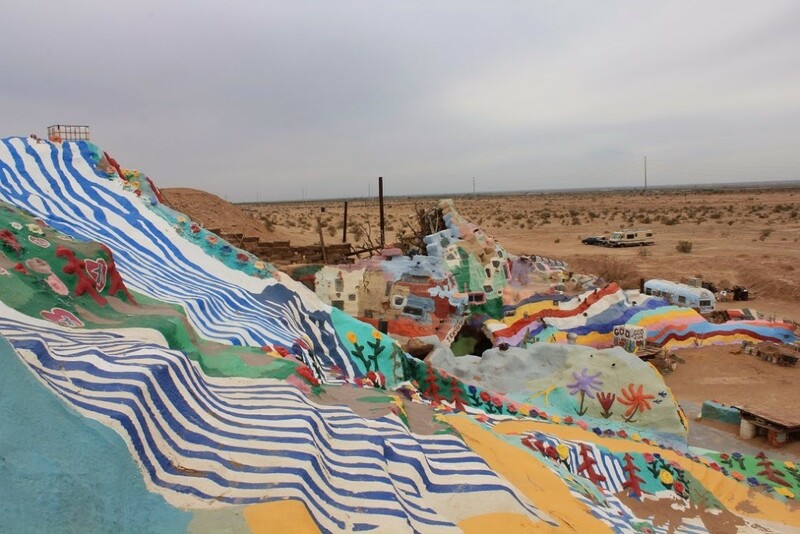 Salvation Mountain is a small hill approximately three stories high which is entirely covered in acrylic paint, concrete and adobe and adorned with Bible verses. 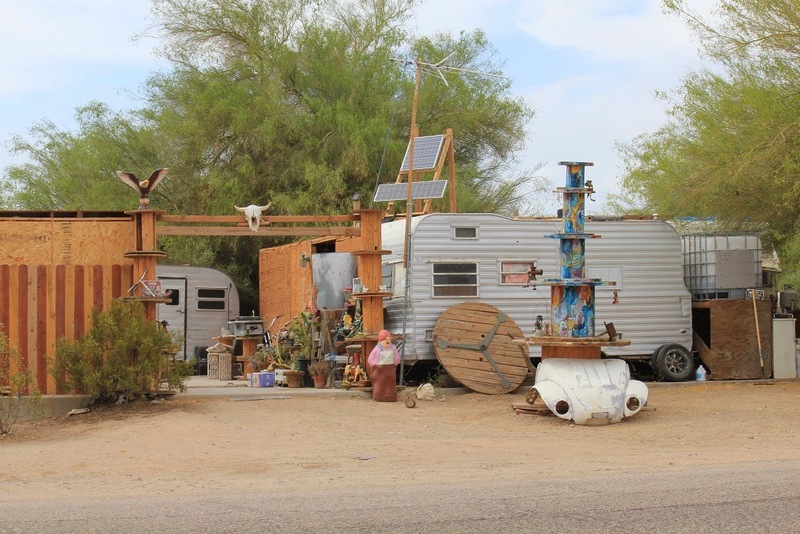 A man named Leonard Knight started building it in 1984 and continued until just a few years ago when he was put in an old age home. 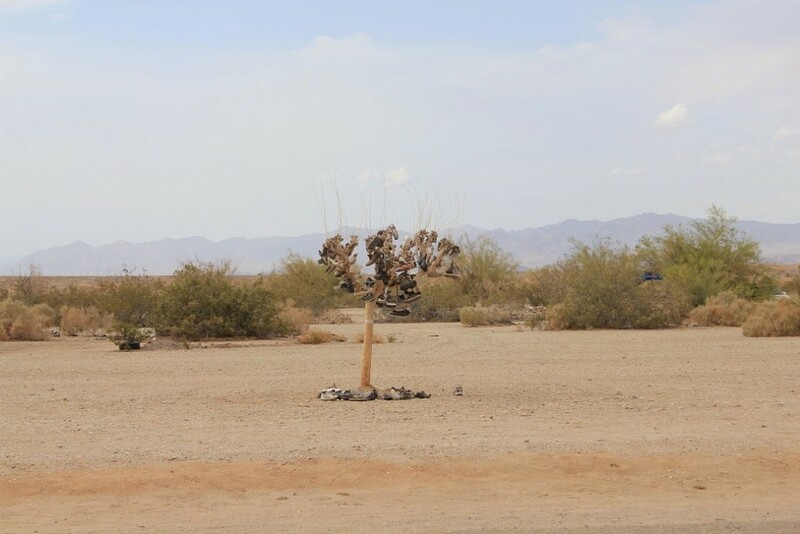 The work on the site was taken over by a group of volunteers and Leonard would come out to visit regularly until he died just this year on February 10, 2014. Leonard had a spiritual awakening when he was 35. He went church to church trying to spread his message, but was never taken seriously. One day he saw a hot air balloon and decided that was the perfect way to spread his message. He prayed for 10 years for a balloon, but then on his way out west, his van broke down in Nebraska and he spent years there sewing his own balloon. 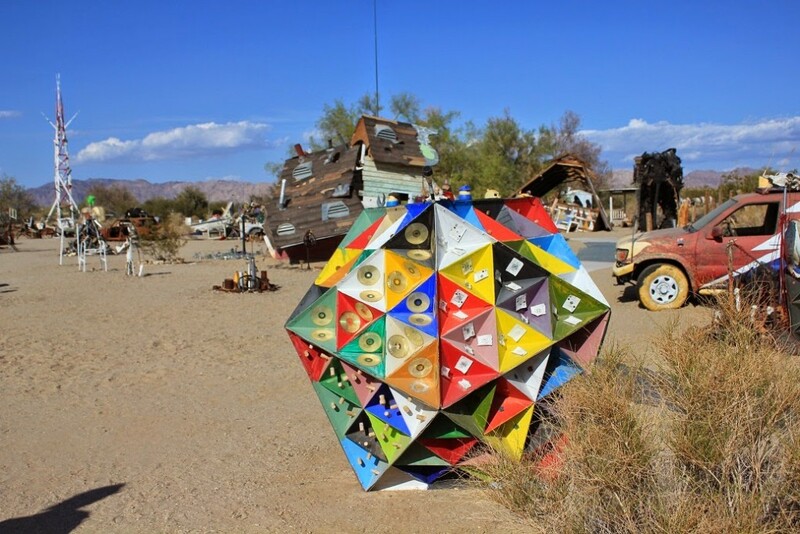 Eventually he made his way to Slab City where he continued his work on the balloon with help from inhabitants there. Unfortunately, he never could get that balloon up in the air. It kept ripping, and he kept repairing it, until eventually he gave up in failure. He decided to leave Slab City, and as a parting gesture, he took one last week to build a small monument that said “God is Love”. But that week turned into two, then into a month, and a year and he just never stopped building. You have got to see this to believe it. Pictures just don’t do it justice. 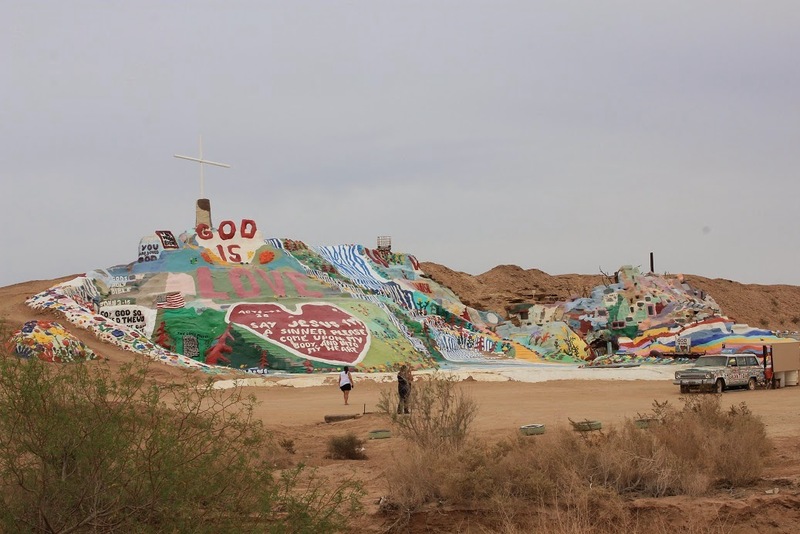 It stands 50 feet high and is 150 feet across, and is so beautiful and awe-inspiring. Walking around it, over it and inside of it, I felt peaceful and reverential, the same way I have felt in amazing cathedrals and temples. The mountain exudes happiness and love, and a faith I will never understand, but can enjoy the fruits of what it drove this man to accomplish. We had planned to get in an hour or two before sunset, but we took a wrong turn, and took more time at the sand dunes and in Niland, so sunset was rapidly approaching when we drove into the Slabs. 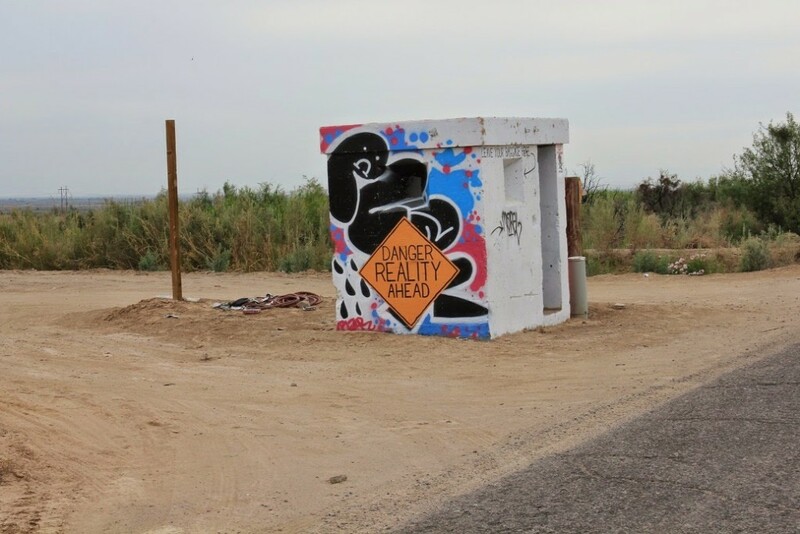 You drive past a guard post, painted over in bright colours, telling you Slab City is ahead, then past some WWII bunkers. I have read that it’s best to stay away from these bunkers as the inhabitants like to shoot at the opposing bunkers. They think it’s all in good fun. 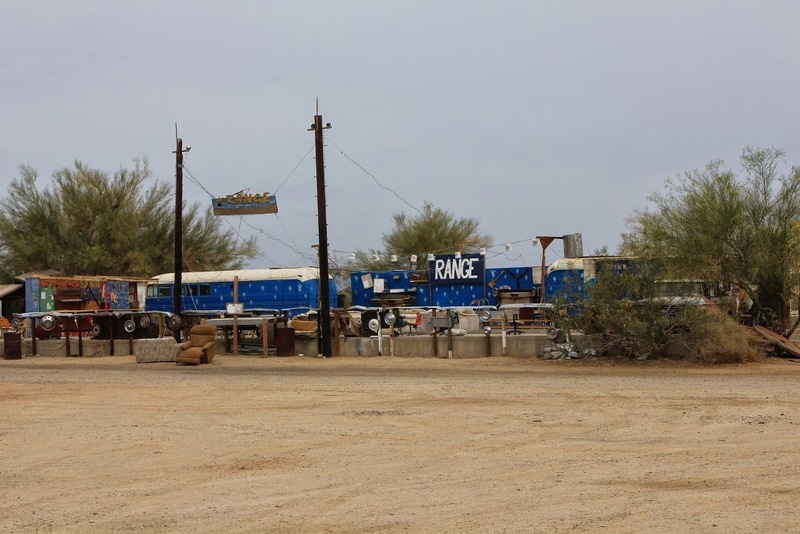 Up on the right, in an open area, we found a place called The Range. It has a stage, lights, amplifiers, speakers, and tattered couches and old chairs for seating. Every Saturday night at dusk, everyone meets for a talent show that features resident musicians and anyone else who wants to perform. It was built by a man who calls himself Builder Bill. 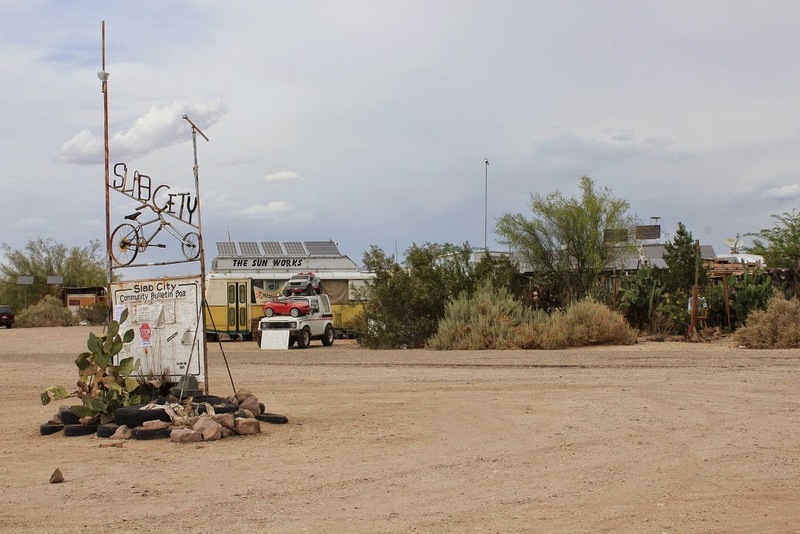 The Slabs has a number of businesses, a tire guy, a solar guy, and a 24 hour library. There are people who work to make it a better place, and others who just want to be left alone. 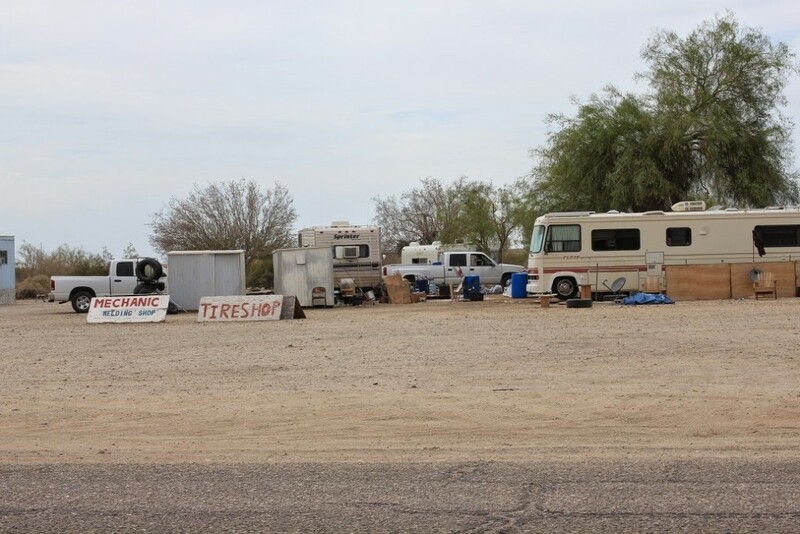 Then there are some real slobs and scary people, who leave all manner of garbage and junk out there all over the place. It’s a real mish-mash of personalities with one thing in common: the desire or need to live apart from society. It makes me think of a post apocalyptic society. It was getting dark and we didn’t know where to go so we turned around and went back to the entrance lot and parked amidst the other RVs there, making sure to give them lots of room. Dogs run free all over the Slabs, and as soon as the sun set, they all took up howling. Toonie could have cared less but Teddy was aggravated by the howling and barking all night long. He must have woken us ten times that night, warning all those dogs to stay away from us. Between the dogs, and other noises from people wandering around, we really didn’t get much rest. 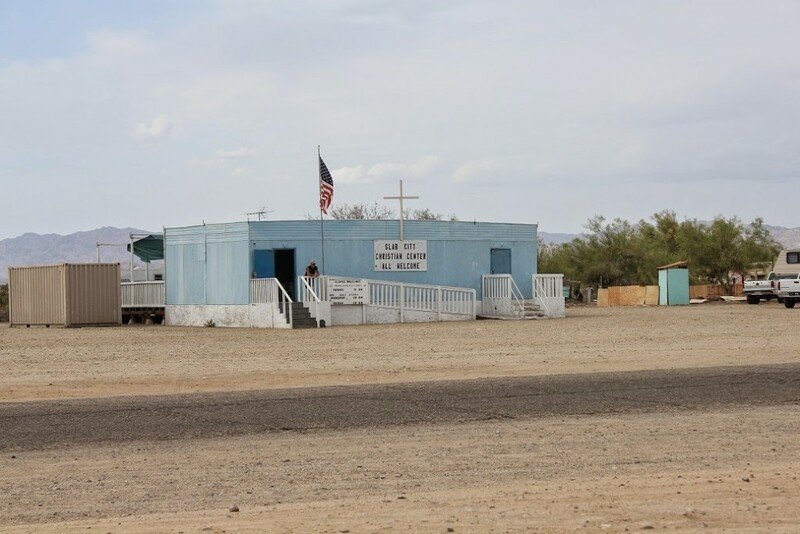 I read about East Jesus on a blog, but couldn’t find out the exact location except that it was far out there, past the end of civilization. I figured they meant it was far past Slab City so we went driving up multiple roads, out into the desert and coming back again. The only thing we found out there was fields of sand with signs warning not to walk out there as there may be unexploded ordinances. 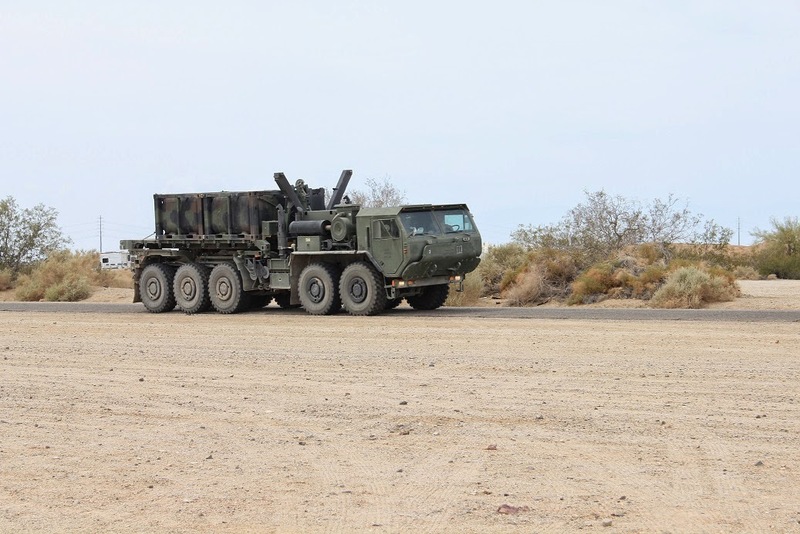 We also came across two small US Marine camps. This was obviously where the army trucks we saw all day coming and going had come from. It’s also where all the loud explosions were coming from the day before. 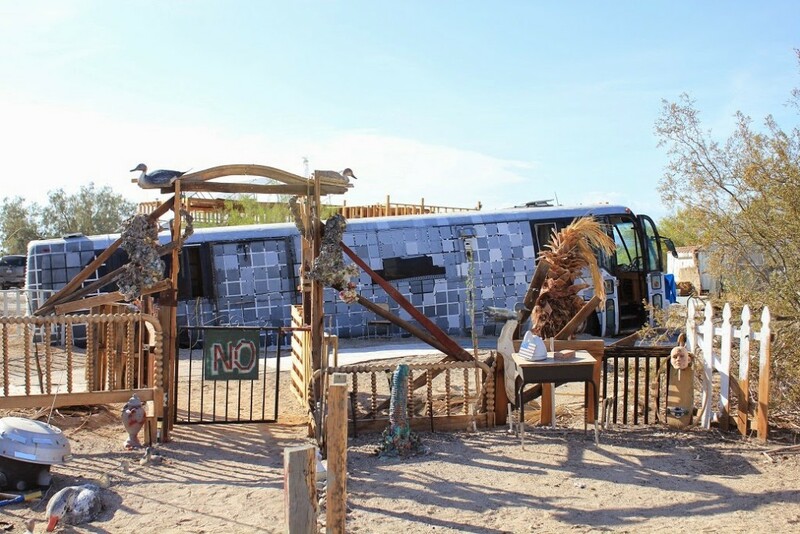 On our third wrong road, we stopped to take a picture of a camp that had created palapa style structures with dried palm leaves. 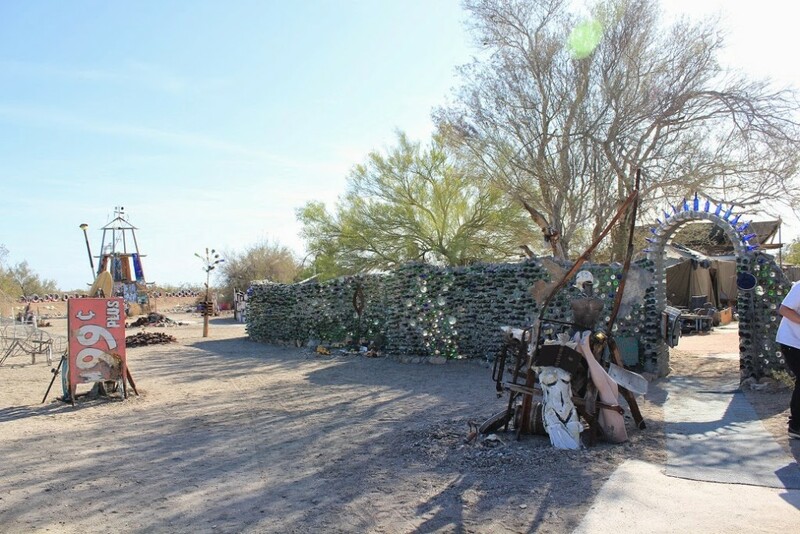 It’s order and beauty was a welcome sight after the garbage strewn slab sites we’d just come from. A woman with heavily tanned, weathered skin came out to greet us, asking us if we were lost. I asked her for directions to East Jesus, and she laughed and told us it was just down the road, at the other road in the fork. We were skeptical, since we’d gone that way already, but decided to take her advice. A short while later, we saw a man and woman walking down the road, and decided to ask again. They were both very gaunt, looked to be quite a mess. We should have passed them by. I rolled down the window, and called out “Excuse me?” The man turned, with the most angry, hate-filled face, growling deep but loud “WHAT? !” It took me aback, scared me, in a visceral way. His hatred was so thick, I felt like I’d just been slugged in the face. I stupidly answered his question instead of just moving on. “Do you know where East Jesus is?” and got pretty much the same hatred spewed at me again. It wasn’t his words so much as the way he spit them at me, as if he’d rather pour gasoline on me and light me on fire or rip out my larynx with his bare hands. He pretty much told me to go to hell, except, in a much angrier, meaner, scarier, more intimidating way. I don’t remember his words. I just remember feeling like we needed to get away as quickly as possible. We drove on another 100 feet and finally saw the sign, right at the bottom of all the other signs. 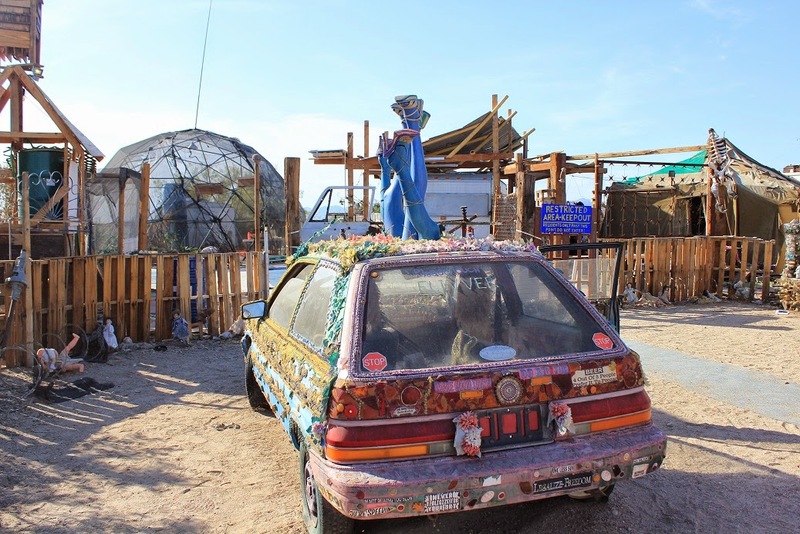 Turns out East Jesus was right there in Slab City, just off to the side of it. East Jesus was thus named because the term means it’s a place way out there, very far away. In their own words, it is “an experimental, habitable, extensible artwork in progress since 2006“. It was begun by Charles Stephen Russell, also know as Chasterus. 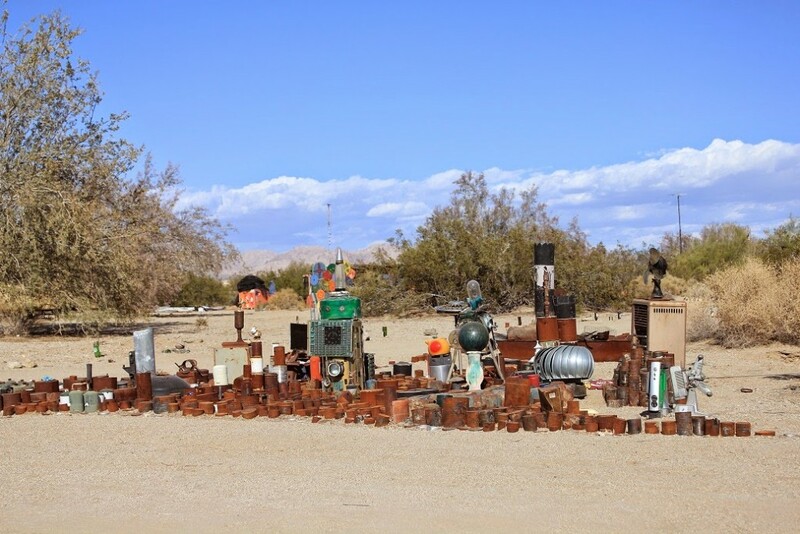 He was a talented artist who found his way to the Slabs and set up camp in a mess of garbage, rust, and broken glass. 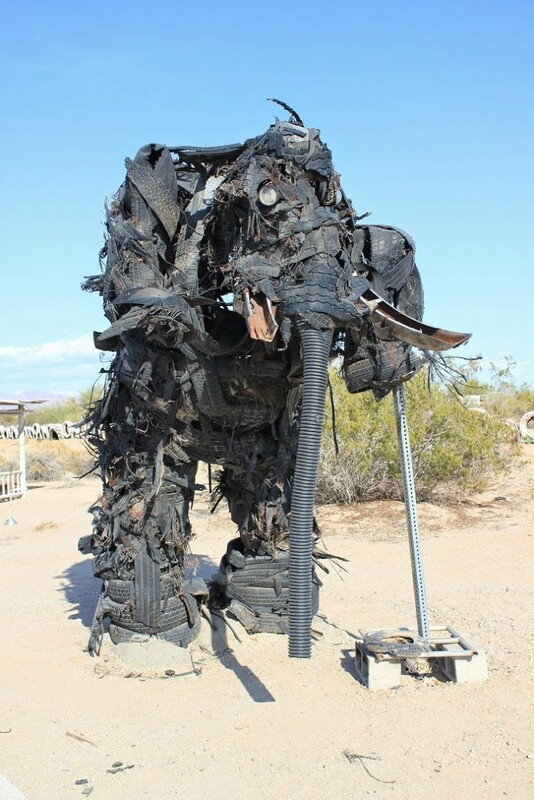 He began taking the junk he found left all over the slabs and recycling it into artwork. As others saw and heard of what he was doing, they came to the Slabs to contribute and live there. 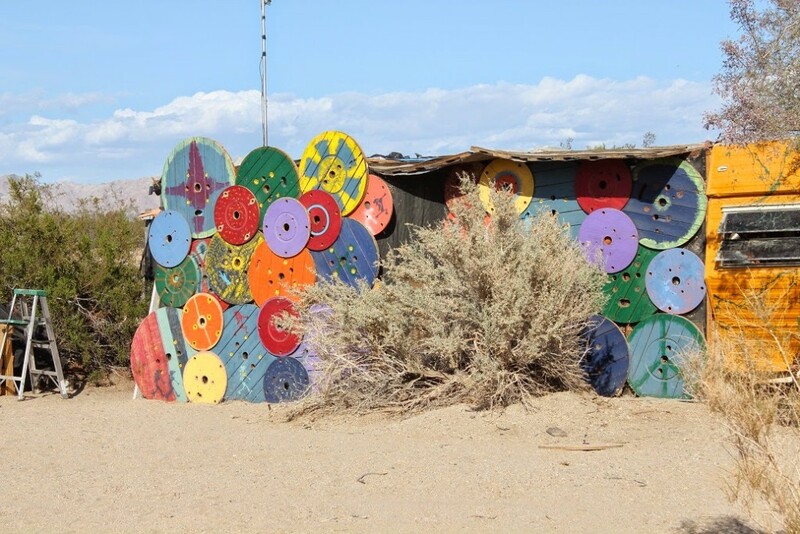 It is now it’s own community of artists, musicians, and laypeople. 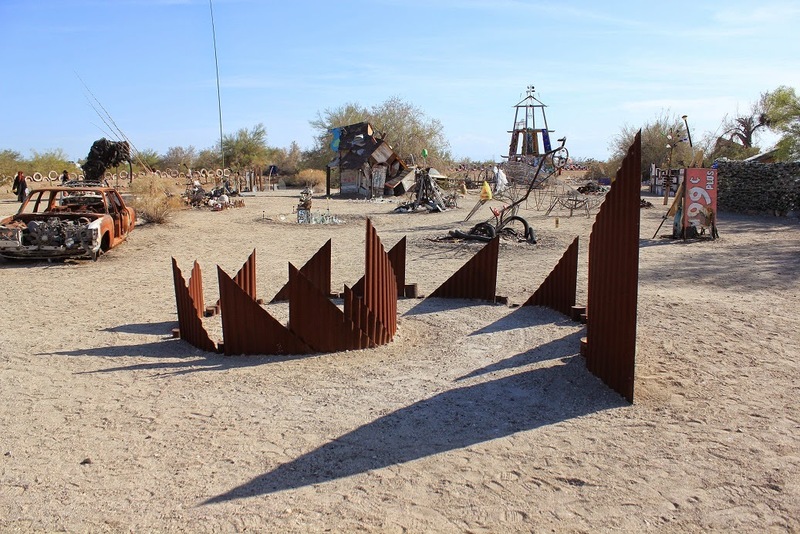 Harold wandered around taking pictures, and I walked the dogs around the art installations. 30 minutes before, I’d have loved all this, but now the road monster’s anger had infected me. I felt angry and disillusioned and bitter. Of course, I knew there were people here who don’t want to be bothered. I understand that many of the types of people who want to escape the world to places like this do it because they don’t fit in, or because they hate the outside world. I guess, inside civilization, I don’t come across this sort of person much in my daily life. I saw a quote recently, “The energy we bring to an encounter with another person invites similar energy in return.” Somehow, I don’t think my polite manners and friendliness stood a chance of changing that guys outlook at all, but I definitely felt his nastiness invade me, and take over my own attitude. Where earlier I’d been interested in the experience of this place and people, and especially by the divergent types living together, now I just wanted to get back to the real world, away from here. It wasn’t just this one couple yelling and swearing at me. It was the nazi in the trailer park, and the meth addicts in Niland. It was the way people have left much of the area, the garbage heaped up, all over the desert areas, under, over and stuck in the plants, and all over the ground. It’s overwhelming in it’s squalor. I’m sure, in hindsight, it will make for an interesting memory and I’ll choose to remember the photos I’ve shown here, the bits of beauty amidst the decay. 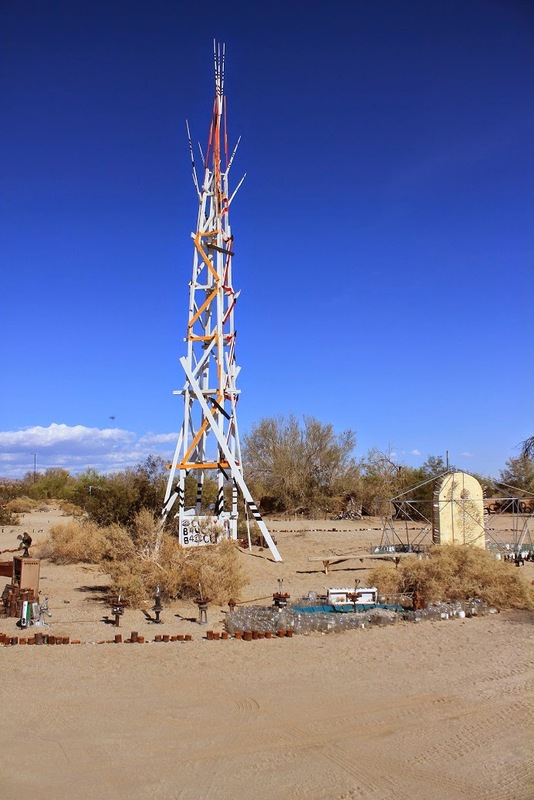 At least, it wasn’t another Tonopah. Garbage: We took our garbage with us and dumped it at gas stations. 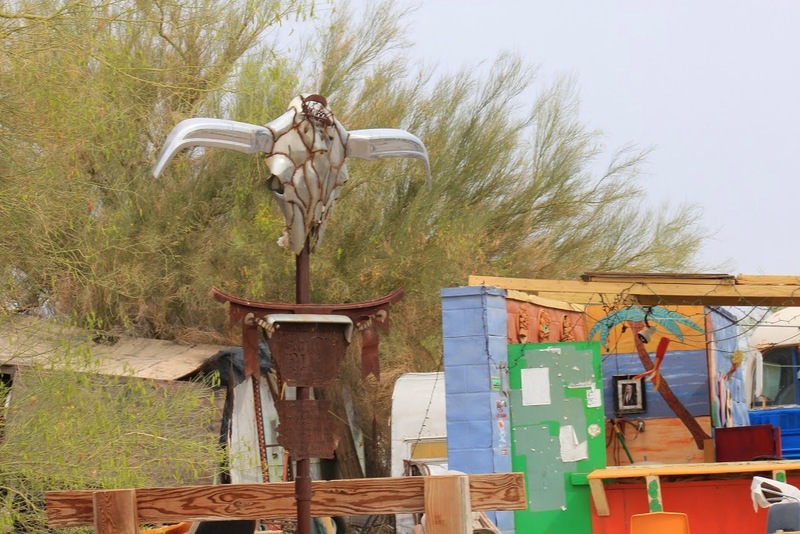 I don't think you'd be surprised to see some of 'the walking dead' wander into Slab City. It honestly felt exactly like that. 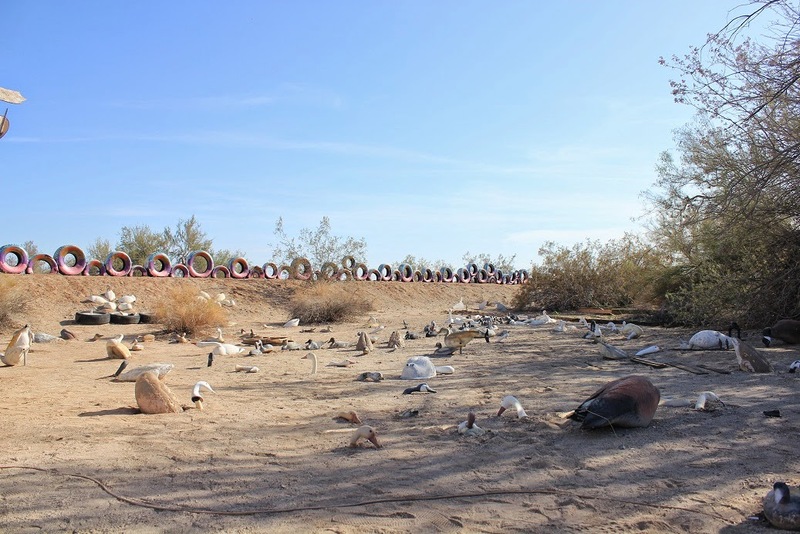 Perhaps it's better during the winter, when Snowbirds invade the area. Excellent post! I hope there is some type of police by the slabs. 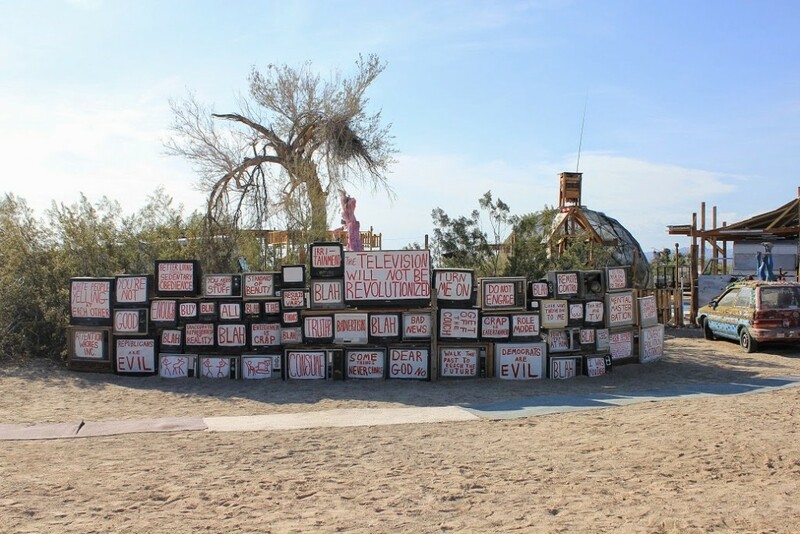 I was wondering the best way to visit salvation mountain in the slabs. 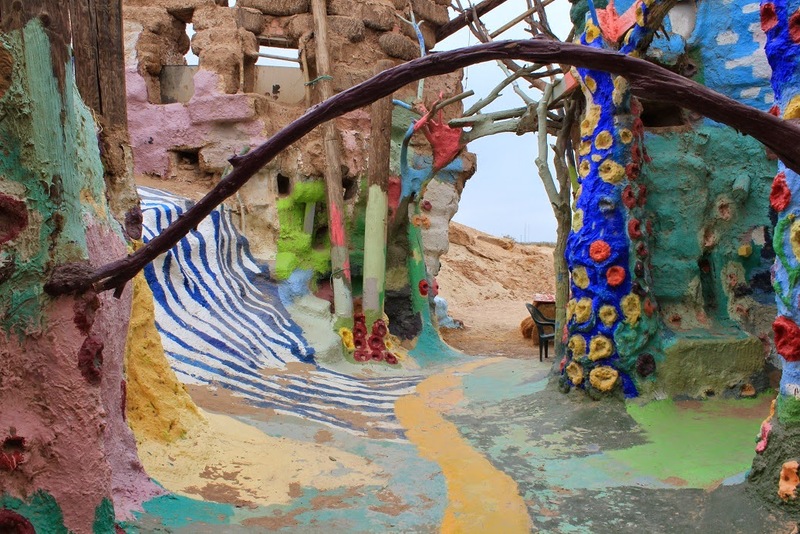 Salvation Mountain is right at the entry to the Slabs.You don't need to go into the Slabs to see it. Definitely we chose a bad time of year to go in, but I don't want to give the idea that it was all bad. I just was feeling a little down after we visited there. We did see a Sheriff's car go through at one point. It's not completely lawless. There are friendly people there too, and it's quite cool to see what the artists and others have created. It's somewhere you have to visit once in your life. We may go back during the Winter in years to come. Yes, I do cross post on Facebook. I just added a link at the top of the pages here to follow me on Facebook. Thanks for the idea. I added your blog to my feedly feed, but couldn't see a link to your Facebook. Oh Tracy & Harold I'm so sorry you had such a bad experience there. It's one of the reasons why we tell anyone interested in showing up, never go alone if it's your first time, always get the lay of the land from RV who know the place and its residents. I'm so sorry it was bad. You went after snowbird season, which officially ends the last Saturday in March after the Prom. 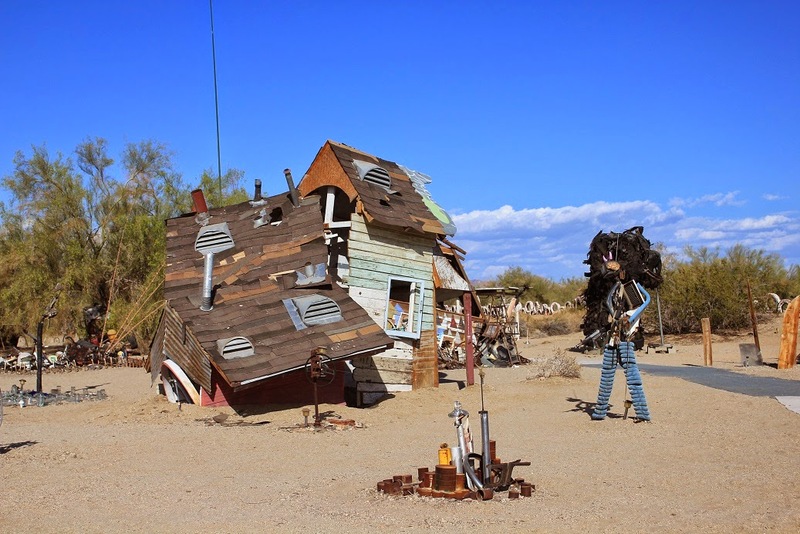 Once that happens, visitors are on their own, I'd never go there at that time and I've been going there for years. I hope that if you decide to go again you'll go with a regular visitor like us! We'd be happy to show you around so you can see that there really is a lot of real awesomeness to the place. We knew it was the wrong time of year to go and it was a very unique experience, some of it very cool, and even the nasty stuff is now an interesting memory. We'll definitely try it out again, but during Snowbird season, and yes, it would be so much better being there with people we know. I'll read your posts on the slabs and I'm following your blog as well. It was great meeting you too!